The road that joins Fasano to Maderno has always been known with the name of “Ruinà” (This means “ruined” in the local slang lan- guage); that was because that zone was often subjected to landslides The ancient mule-track which in that zone descends from Maclino is called Proch (derived from the German word “gebrochen”, meaning “ruined,broken” ). On the 7th April 1958 a big hill-fragment slowly deta- ched from the hill itself, invading the road below, and finally it dived directly into the lake. 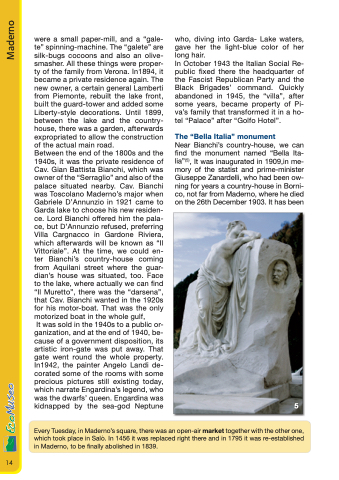 Luckily, there were no deaths, but Toscolano Maderno and the other “North-Riviera” villages remained isolated for weeks. Part of the eroded material splashed into the lake and part was brought to the beach towards Maderno, and so that beach was definitely erased. The new conformation of the provincial road (already royal road in that case, too), dates back to 1899. The actual main road, known as “The Gardesana”, dates back to 1932.